My favorite book on parenting is Finding Your Purpose as a Mom by Donna Otto. I bought this book at Borders one afternoon while browsing around, shortly after my oldest child was born. It stayed on my bookshelf for about a year, until spring 2007, when I had extra room in my schedule and my mind to take it all in. Over the past two years, I have read and re-read this excellent book, and endeavored to put many of Ms. Otto’s tips into practice. Finding Your Purpose as a Mom is filled with practical ideas. I love Ms. Otto’s chapters on keeping the home in order, maintaining peaceful relationships with family members and friends, and making the house a welcoming, inviting home. But beyond the practicality of her ideas lies chapter after after chapter about envisioning the future for your family – having an idea of how you’d like your kids to grow up, and living intentionally to seek after those goals. I want [my home] to grow a man or woman of prayer. I want [my home] to grow a person of character and integrity. I want [my home] to grow a culturally discerning person. I love the author’s gentle insight. She is older than me (probably older than my mom), yet her wisdom doesn’t seem dated. Rather, it’s timeless. She shares many stories from her own parenting experiences – successes and failures – to flesh out her advice, and she is encouraging to her readers in such an inspiring way that I feel refreshed after consuming any chapter. It moves me to action. If you are needing some inspiration or advice amidst this vast and tiring career called motherhood, Finding Your Purpose as a Mom is an encouraging “shot in the arm”. Donna Otto’s book Secrets to Getting More Done in Less Time is also great – an in-depth outline of her specific strategies for organization of home life. Both of these books would make great gifts, too – especially for a new mom. What unconventional parenting books have made a difference in your life? Do share! And have a great weekend, Mom Crowd! Ok, so I’ll admit it… I use disposable diapers and I love the ease and convenience of them. I always thought that I would only use the most expensive name brand diapers because “my children deserve only the best”. My friends will all attest to the fact that I was a sold-out Pampers snob with our first child. So often they commented on it that it’s now just kind of a running joke, especially since I only buy generic diapers for our second child. Oh the things I have learned in my four years of motherhood! Overall, we have been really happy using the Parents Choice and Up and Up diapers. Admittedly, we kept our son in Pampers longer than we would have liked because he was difficult to potty train and Pampers went up to a size 7, but just changing one kid to store brand diapers saved us over $50 a month! What has your experience with store brand/generic disposable diapers been? 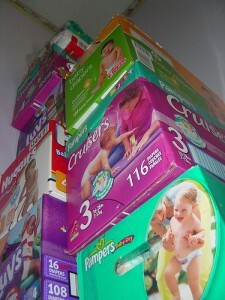 How many brands of diapers did you try before deciding on the right one for your child? Now that I have 2 children 22 months apart I have been pining for a double stroller. I have tried to get by without one for as long as I can with various strategies. One way is putting my 3-month-old son in a Baby Bjorn while pushing my 2-year-old girl in our huge Graco stroller or in an umbrella stroller. Another way is pushing my baby in his car seat on a travel frame stroller and chasing my daughter. Going out has been difficult! We had 3 different strollers in my car: 1 small umbrella stroller, the huge Graco travel system stroller, and the travel frame. I wanted to only have 1 stroller to fit my needs. I decided that it was time to put some cash down on a double stroller. There are so many factors to consider before buying a double stroller. No double stroller is perfect. You just have to pick one that is closest to your needs. 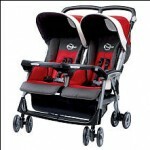 Buying a used double stroller can be a great deal if you can find one that is in pristine condition. I had three friends tell me that they had bought used double strollers and found that the wheels stuck and didn’t ride smooth. I also searched Craigslist every day and even placed a “Want to Buy” ad, but never found what I was looking for. I could have bought a nice used one from Ebay, but we are going on a trip and I didn’t want to wait for it to be shipped. A new double stroller is clean and has new wheels. I plan to use my stroller for a very long time, so I felt like I would get my money’s worth with a new one. My friend, McKenna, has used both a tandem and a side-by-side. She said that the child in back of the tandem couldn’t see and didn’t like sitting back there. Although, it was nice and compact. A side-by-side allows both children to see and be next to each other. I know that my daughter loves being next to her brother, so I felt like she would love it more than a tandem. Jogging Style or Umbrella Style? This is just a matter of preference. Where are you going to use it more? A jogging stroller is great for running, parks, the zoo, and amusement parks. Jogging strollers can also take up a lot of room in the truck and be heavy. An umbrella style is great for shopping and doctor office visits, but can also be used at parks and amusement parks. I didn’t want a huge jogging stroller and felt like I would get more use out of the umbrella style. I like the lightweight compactness of the umbrella style. Durability. Does it have a good reputation for lasting a long time? A mom of two sets of twins in the store told me that she had used this stroller. The wheels got stuck often. Also the plastic piece that opens the stroller had broken off on a tarmac and airport staff had to find it. The sales guy at Babies R Us also immediately said that this was a horrible stroller, because it is made of cheap plastic and was not worth its expensive price tag. 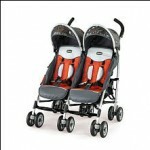 The Mac Daddy of aluminum double strollers, this pricey double stroller is incredibly durable. It also has the smoothest ride of all umbrella double strollers. The 5-point harness is easy to snap together. Also the straps are made of a soft material which is nice when rubbing against skin. The bottom strap is thin and while it held my 3 month old fine, it didn’t look very secure. The maximum weight is 110 lbs which means it could last a very long time as your children grow. The pockets in back are also nice, because they have a velcro lid to secure the contents in the pockets. One friend complained that it isn’t easy to set up, but you can get used to it. Also, I think you have to use your foot to pull up on a pedal to break it down, which may hurt your feet if you wear flip flops often. The sleek, simple design is nice. This stroller weighs 24 pounds (the weight of my toddler) and is easy to set up and break down. To break down you have to step down on a pedal and pull up two handles. The downside is that it only clicks together on one side when folded, so the other side hangs open a bit. This isn’t really a big deal, because the handle to carry it is on the side that clicks together. This stroller also has 4 adjustable positions. I liked that the bottom strap of the 5-point harness is very wide securing in a little baby. It also comes with a boot that folds out to give further security to holding a newborn. The shade doesn’t cover much. The pockets underneath and in the back are adequate. Also, the ride is smooth enough. It is quite comparable to the MacLaren Twin Triumph. 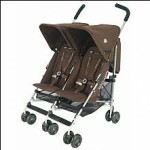 We ended up getting the Chicco Trevi Twin, because it was marked down to $169 from $229. We couldn’t justify spending almost $100 more on the MacLaren. We immediately used this stroller after purchasing it this weekend at an outdoor mall and got many looks and a compliment. It is so convenient to have them in one stroller! A bonus is that my husband likes to push it, because the handles are wide apart and they are comfortable for his broad shoulders and his height. I am in love with my new double stroller. Do you have a double stroller? Which one? Do you like it? 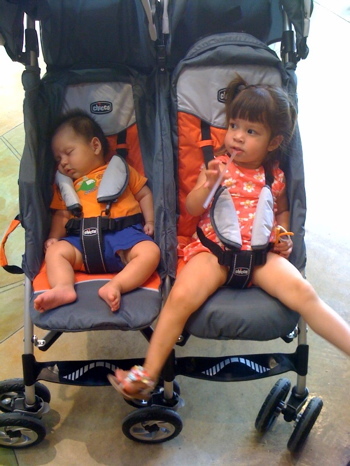 What did you consider when purchasing a double stroller? I have been a reading like crazy. I had originally resolved to read 26 books this year (roughly two per month), but I started off so strongly that I am actually shooting for 52 by year’s end. I am not reading many difficult books, so I don’t want you to think I’m some sort of Rory Gilmore. Sure, I’ve got a decent piece of literature here & there, but it’s usually surrounded by plenty of fluff. 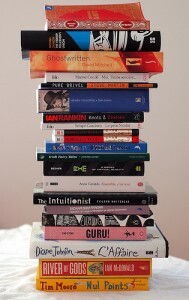 You can see my 2009 books-finished list here. Last month, I completely raced through The Wednesday Sisters by Meg Waite Clayton. It was published about a year ago, and I saw it on the paperbacks table at Barnes & Noble. Because I love The Divine Secrets of the Ya-Ya Sisterhood so much, I have a radar for any fiction about a group of women friends with the words “society”, “sisterhood”, “club”, etc in its title. This trend both entertains me and makes my eyes roll. Anyway, this story about five mom friends in 1960s California who become published authors sounded quite intriguing. I was not disappointed. The story is told through the eyes of narrator Frankie, and she describes the evolution of her friendship with Kath, Linda, Brett, and Ally – all young mothers who spend their mornings together chatting at the park while their children play. It was nice to read about moms who still yearn for friendship after having young children. And when these believable characters started an amateur writing circle to engage themselves creatively, I was both envious and inspired. Various subplots woven throughout the book had the five principal characters seeing each other through pregnancies, miscarriages, unfaithful spouses, taboo interracial relationships, the womens’ lib movement, major illness, and the highs and lows of 1960s/70s American history. Though this is fiction, I was kind of amazed by the medical subplots. Some of the characters were dealing with major health crises, and the way they were treated astounded me – after all, the 1960s were only 50 years ago. I was born in the mid 70s, so to imagine my mom might have had a similar experience while pregnant with me is fascinating. 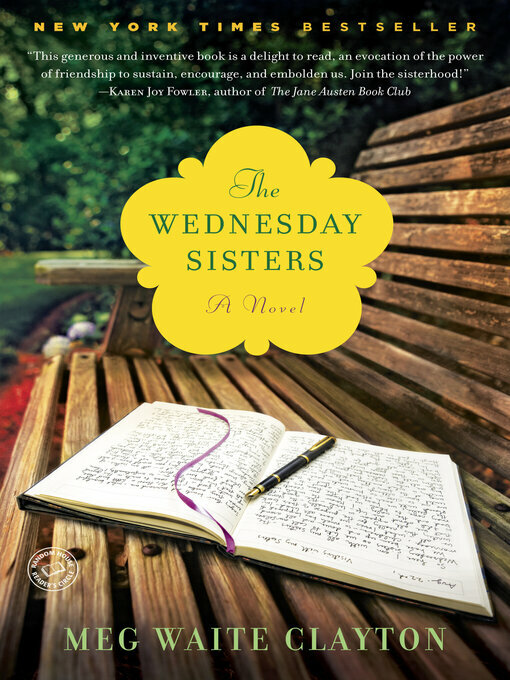 If you’re looking for a breezy, heartfelt read about moms who seek comfort in their friendships with others, The Wednesday Sisters is a great choice. What are you reading this summer, Mom Crowd? True Confessions: How Messy Is Your Mom-mobile? It’s something I swore I’d never do: let my car get messy after having kids. My car was relatively clean before we had babies, and I thought if I kept up with it enough, it would stay that way once the kids got older. Pretty naive, huh? I used to be so grossed out by family vehicles, frankly – all the old Cheerios, grubby toys, and crumbs on the seats. Ick! Go into my garage, though, and you’ll find out that my car is decorated in the exact same way. 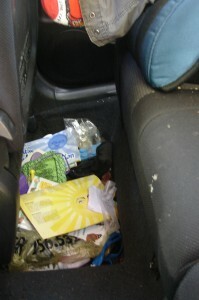 A few weeks ago I was surfing the internets and found out about this contest (now over): Mom’s Messy Car Photo Contest. It made me a little relieved to see that this trend is more common than not. Even though the contest was expired, I got my camera and grabbed a few shots anyway. Here’s a peek! 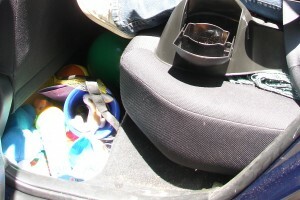 Your standard collection of toys on the floor of the car, almost never played with. This one shows a bit more garbage, which grosses me out. How did I let that happen? Finally, you have a shot of my daughter’s handprints all over the back-inside of the car. Rest assured, she is not bumping around the back of the car while it’s moving. (If you must know, hubby & I were “discussing something intently” while sitting in a parking lot, and we let her climb over the seats to keep her busy.) This is the kind of thing I will never get around to cleaning – I barely go through a drive-through car wash, much less take windex & a towel to the interior side of the windows. I often comment to friends that I desire to have a clutter-free, “Real Simple-style” home, but who are we kidding? With toddlers, this is just not realistic. If I prioritize a beautifully clean car, that means I am sacrificing something else: time and joy with my kids. So for now, the deal is, I let some messes slide in the name of preserving my sanity. I want to teach my kids how to pick up after themselves, but I don’t want to be on them every two seconds about throwing a toy on the car floor. If Rice Krispies make them happy, I’ll vacuum up the dropped ones eventually. I’m okay with my messy mom-mobile. What about you? On a scale of one to ten, how messy is your family car? Do you have any practical tips for keeping it organized?